My eyes pop open and I remember I was going to look up a Bible verse a friend and I talked about the other day. There were some related verses, but I don’t remember where to find them, so a quick Google search took me there. I wrote them down, read the Bible commentary, and put down my books. Oh, wait. A quick text to a friend saying yes, I want to attend the Thursday morning Bible study she’s teaching. Back to prayer. Eyes closed. What can I do to bring you joy, Lord? Oh, wait, I’m supposed to ask you about everything I add to my calendar, so I guess that means the Bible study I just signed up for. But surely you want me to do things related to ministry. I need to write, but this gets me into the Word, which is always good for me. How do I know what to do? Is it faith to assume that the things that come my way—the speaking and writing opportunities—are all from You since that’s what I want to do? Is it irresponsible to put those things first and then squeeze in work later? I need to earn some money. But I want to serve you. Do those have to be mutually exclusive? Why can’t I remember to ask Your opinion about ALL the things that come my way—every work project, every client, every meeting, every idea? I need to do the social media posts for the new prayer prompt calendar. Excited about the one I just made for the upcoming prayer workshop. And that retreat idea I just had is really interesting to me. I think there’s a need for it. I wonder who can help me? Oh, did I write down the insight I had about Paul speaking in the language that his hearers would understand? That’s so important, especially to those of us whose ministry is writing. I should do a blog post. Oh, and those verses I looked up, those would make a good post, too. I glance back at my Bible and read another verse. It’s circled, but I don’t remember it at all. It would be a good one to include in the book I want to write someday about doubt. Better get that down. I reach for my laptop and notebook, then stop mid-reach, exasperated with myself. Why can’t I ever focus on prayer? Why are my thoughts so disjointed? And then it hits me. When I sit down to pray, I keep being distracted by the creative spark—neurons firing, ideas traveling at the speed of light. 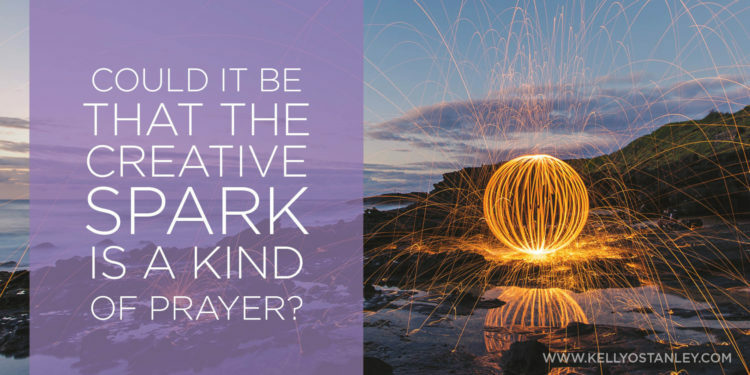 Could it be that the creative spark is a kind of prayer? Could it be that these ideas, this excitement and passion and burst of energy, are prayer? How many times have I said—and written—that God is the ultimate Creator, the originator of ideas, and that when we create, we are closest to Him? So why is this only now dawning on me? Why am I beating myself up for not praying properly, when I’m the first to say there is no such thing as right and wrong in prayer? Help me, Jesus, to find the right balance between time spent talking to you and time spent creating and recording my ideas. Help me distinguish between the ones that are from You and the ones that are only mine, and let me pursue only the ones that come from You. Let me operate in a fullness I’ve never yet realized, using every last bit of ability you’ve given me. Let me waste nothing. I’ve often said that Jesus went away in the mornings to pray—but then he got up and acted. He healed and taught and draw people to him. He didn’t seem to stop and ask for direction along the way—he sought God first, and then he trusted that God would be with Him. That’s what I want to do. And that is what I try to do, to believe that what I encounter throughout my days comes from You. I try not to hesitate. But I don’t want to delude myself into believing something that is not true. I don’t want to let myself get so consumed with these sparks of ideas that I neglect the One who provides them. I don’t want to pull away and make them about me instead of about You. Thank You, Lord, for the way You speak to me—in insights, bursts, creativity. Thank You for speaking to me in prayer, in a new way, and for showing me the things You do. You are amazing, and I am so blessed, and I don’t know what I’d do without You. Your honesty and transparency are refreshing to me. Thank you for being you, for sharing your heart and for being…real. I am so very thankful that God crossed our paths! get outta my head, Kelly Stanley! heart you like crazy!